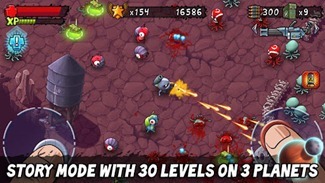 Gamelion released the highly anticipated dual joystick shooting game Monster Shooter to the Android Market today. 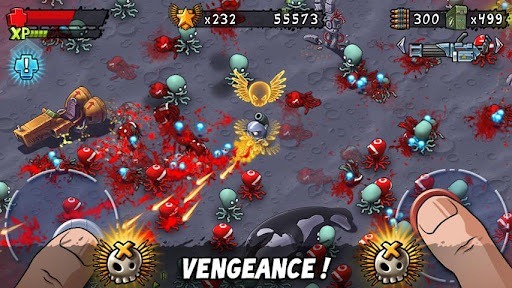 The game is a dynamic, quirky shooter that takes players to various alien planets, and gives them a wide arsenal of weapons, power ups, missions, and competitive rankings a la OpenFeint. Monster Shooter puts players in the shoes of an alien named Dum Dum, whose cat has been stolen by an opposing alien race. Following the most reasonable course of action, Dum Dum ventures out with an impressive selection of weaponry, and a bloodthirst that will eliminate heaps of enemy aliens across a ton of levels. The game includes two modes of play: Story mode, in which the above narrative is played out, and Survival mode, in which players pursue high scores and leaderboard fame. It's worth mentioning that Monster Shooter is completely free in the Android Market, with optional in-game purchases. There's no doubt Monster Shooter will make a great addition to your mobile gaming portfolio, so hit the Market link below to try it out.